New Delhi, April 16: Rains last night has given respite to residents of the national capital from scorching heat, as temperatures dipped to as low as 20.5 degree celsius on Tuesday morning. Among areas which witnessed downpour in Delhi include Kalkaji Extension, Patparganj, Indraprastha Extension, Mayur Vihar and Majnu Ka Tila areas. Monsoon 2019 Forecast: IMD Predicts 'Near Normal' South West Monsoon. A spell of dust storm, as predicted by the India Meteorological Department (IMD), is predicted to hit parts of North India. While the storms combined with showers were expected between April 15-17, the two days have not witnessed more than windy conditions in most parts of the north. Dust Storms, Rains, ThunderShowers to Hit North India From April 15-17, Predicts IMD. 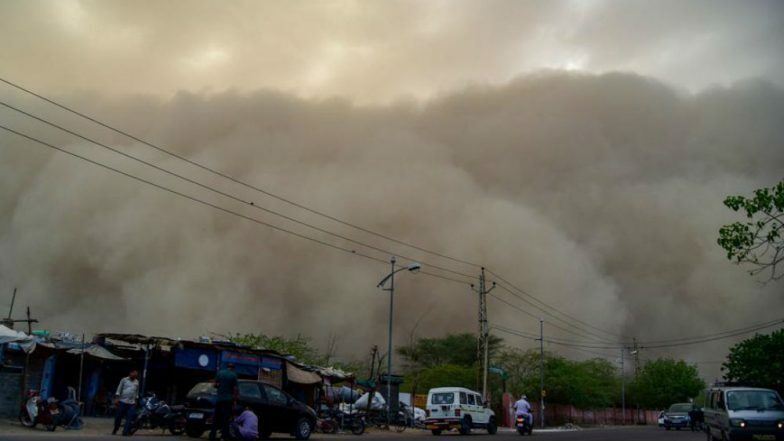 Weather experts, however, claim that a subdued western disturbance has made landfall in Indian borders of the subcontinent, and is likely to result into dust storms in parts of Rajasthan, Haryana, Punjab, West Uttar Pradesh and West Madhya Pradesh. The out-of-turn change in weather is due to the western disturbance -- a cold spell originating from the Mediterranean Sea and moving towards the Indian subcontinent. The neighbouring state of Pakistan has been worst-affected by the thunderstorms, with at least 23 deaths being reported so far. Among regions where the fatalities were reported include Karachi, Quetta and parts of Punjab province as well. The IMD prediction for India also included hailstorm in the Himalayan region of Jammu & Kashmir, Himachal Pradesh and Uttarakhand. In the plains, storms with wind speed of 60-70 km/hr were predicted. Ahead of the weather department's warning, several parts of southern and central India, including the parched region of Marathwada, witnessed rainfall.